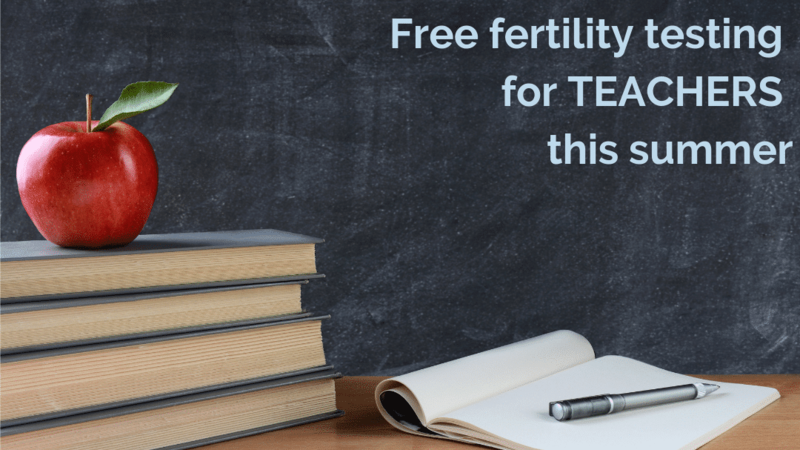 Teachers: Get the information you need to plan for your future family! A blood test is now able to tell women, more easily than ever before, about their potential to become pregnant. This test, known as anti-Müllerian hormone (AMH), is used to measure ovarian reserve—the quality and quantity of your eggs. This result helps doctors determine your chances of becoming pregnant now and in the future. You can take the test while on the birth control pill or at any time during your menstrual cycle. Register using the form here. Then come to any one of our Connecticut locations Mondays through Fridays between the hours of 9:00–11:00 a.m. to have your blood drawn. You will be asked to complete a lab requisition form and consent once you arrive in our office. One of RMACT’s nurses will call you with your results in 10–14 business days. If you have questions, please call one of our New Patient Liaisons at 203-956-2265. This offer is valid Monday, June 17, 2019 - Wednesday, July 31, 2019. Let Us Know When to Expect You! The RMA of Connecticut team includes lead physicians Drs. Mark P. Leondires, Spencer S. Richlin, Joshua M. Hurwitz, Cynthia M. Murdock, Shaun C. Williams, as well as fertility specialist, Dr. Ilana B. Ressler. All six physicians are Board-Certified Reproductive Endocrinologists and are members of the American Society for Reproductive Medicine (ASRM). Our team of doctors are named as Castle Connolly "Top Doctors" and are members of the Society for Assisted Reproductive Technology (SART). RMA of Connecticut’s IVF laboratory is accredited by the College of American Pathologists (CAP), and CLIA. Other accreditations include the Accreditation Association for Ambulatory Health Care (AAAHC). RMA of Connecticut has offices in Danbury, Norwalk, Stamford, Trumbull and Poughkeepsie, New York.